Ireland's home-produced multinationals - including the likes of CRH, Kerry and Ryanair - generated in excess of €192bn of sales abroad in 2016. The US and UK accounted for almost 58pc of the turnover. Data from the Central Statistics Office (CSO) released yesterday shows Irish-based multinationals were responsible for employing over 856,000 people abroad, just over a third of them in the US and the UK. The statistics are based on the overseas affiliates of businesses where 50pc of its controlling interest is in Ireland. Looking at the UK ahead of Brexit, the data showed that turnover in Irish affiliates there decreased by almost 10pc in 2016 compared with a year earlier. However, UK employment in those companies increased by just over 2pc during the period. As Brexit looms, and sterling continues to fluctuate, the performance of Irish firms operating in the UK is a source of mounting concern, as the future of trade terms and conditions between the UK and EU member states remains uncertain after March 2019. In the US, employment in Irish affiliates rose by almost 30,800 in 2016 - an 18.3pc increase compared with the previous year, while turnover increased by an impressive 22.7pc over the 12 months. Overall, 82pc of turnover generated abroad by Irish firms was in the services sector - including distribution - while 15pc was in manufacturing. There is a similar picture when looking at the employment levels of Irish multinationals abroad. The services sector, again including distribution, was by far the dominant Irish employer of workers abroad, accounting for just over eight in every 10 jobs. Meanwhile, manufacturing accounted for 15pc of total employment. Other industrial and construction sectors employed 0.5pc and 0.1pc of people abroad respectively. The low figure for construction comes after Enterprise Ireland boss Julie Sinnamon earlier this month said that construction exports by Enterprise Ireland clients to the UK grew by just 1pc last year, having grown by 9pc the previous year. That slow down reflected delayed decision-making in the UK linked to the uncertainty of Brexit, as well as a very strong domestic market for construction in Ireland, Ms Sinnamon said. 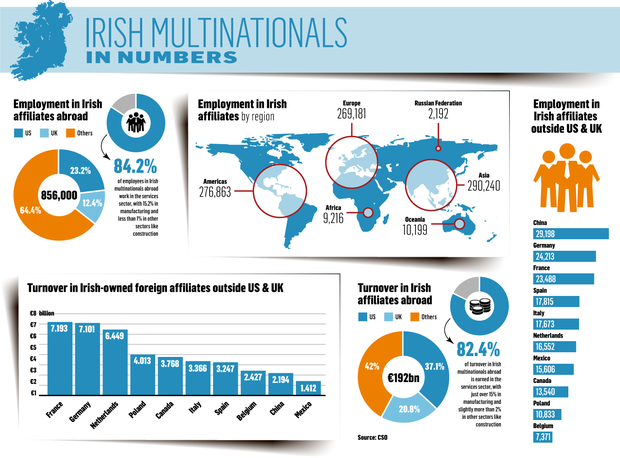 The 2016 data points to a general rise in turnover and employment in the overseas arms of Irish multinationals, in markets beyond, the US and UK. The data shows employment of more than 20,000 in each of China, Germany and France, by Irish-controlled firms. In terms of turnover, Germany, the Netherlands, France and Poland each produced over €4bn. There are around a dozen countries where the combined revenues of Irish-owned firms exceeded €1bn a year. Beyond the big Irish markets, Canada, Italy and Mexico host Irish affiliates employing just under 375,000 staff, which produced almost €40bn, or just over one-fifth, of the total combined turnover of the sector. The expansion of Irish-owned businesses into new markets fits with the Government's so-called 'Global Ireland' initiative to expand Ireland's range of export destinations. That initiative will see a series of new embassies open in Chile, Colombia, New Zealand, Jordan, Ukraine, the Philippines and Morocco, along with consulates in Vancouver, Mumbai, Cardiff and Frankfurt.